That would be absurd, wouldn’t it? Giving everyone the same sized boots would just be daft, if for no other reason than it would undermine the effectiveness of the force. The military would never do something so silly, right? Wrong. The fact is that the ‘one size fits all’ approach is rife—admittedly not for boots, but for all sorts of equipment that matters. The ‘we treat everyone the same’ justification is particularly common—and pernicious—in the case of female members of the military. The use of this supposed ‘standard of equality’ is often just not properly thought through, or else is a disguised way of saying ‘women don’t belong here, they don’t match up’. But the idea that having women in the military inevitably involves lowering standards confuses gender blindness for gender neutrality. The military has been a male-dominated profession for so long that it’s sometimes difficult to see that what seem like neutral standards are in fact very much male-centric standards. Genuine gender neutrality starts by focusing on what military effectiveness actually entails and works backwards to equip and enable both men and women to achieve those outcomes, even if that means that in some respects men and women are equipped differently or even trained differently. (The current approach equips and trains in accordance with flawed proxies for military effectiveness that have come to be largely taken for granted.) And a more nuanced and sensitive approach shouldn’t end at gender lines: body size, body shape, and left or right handedness are just a few more of the differences that characterise human beings that ought to be taken into consideration in an ‘outcomes based’ approach to military equipment and training. What does that mean in practice? I’ll just mention three examples: backpacks, body armour and rifles. It’s probably not escaped your attention that male and female bodies are shaped somewhat differently. Many backpack manufacturers offer packs designed to match female physiology, with shoulder straps designed to reflect women’s narrower shoulders, hip-belts curved to follow the shape of a woman’s hips, and so on. Yet military-issue backpacks, including those used in the ADF, are of a standard design and are issued regardless of the troop’s gender. Sure, they’re adjustable, but a woman isn’t simply a small-statured man! A pack that takes male physiology as its start and end point is unlikely to be an optimal fit for a female. Likewise with body armour. Despite becoming a standard part of individual military equipment in the US for around four decades, it was only last year that the US Army became the first military force in the world to announce that body armour designed with the female form in mind would be introduced, as part of their new ‘Soldier Protection System’ (SPS). Decades late, but at least they got there, right? But wait; industry reports  indicate that the revised requirements for the SPS have, in fact, dropped the requirement that a ‘female fit’ version of the body armour be produced. So once again we’re back to ‘we treat everyone the same here’. And again private industry is showing us what ought to be—Tyr Tactical has recently announced the launch of its new body armour system  which is available in both male and female cuts. One last example: rifles. I’ve addressed this issue previously , but it seems worth reiterating that the F88 Austeyr is a classic case of ‘we treat everyone the same here’. I recently observed some members of the ADF undergoing combat-focused firearms training. Among the 12 trainees under instruction there was one particularly tall male and one small-statured female, both of whom struggled to employ the F88 effectively due to the fact that the length of the rifle is not adjustable (unlike the AR-15/M4 family of rifles used by the US military and Australia’s special forces). I cringed at the awkwardness on display as the trainees practiced shooting around cover from their non-dominant side. This is difficult enough in general, without having to also deal with the F88’s propensity to eject scalding hot brass into the shooter’s face. The ‘enhanced’ version of the F88 now entering service goes some way to addressing this, though it’s a solution that remains less than ideal. But the length of pull issue has not been addressed, and indeed, given the basic design of the rifle, cannot be addressed. That Defence has continued to pour money into tweaking what is fundamentally a design unsuitable for modern combat defies the logic of military effectiveness. Given that the obvious alternative, the AR-15/M4 family of rifles, could be purchased for significantly less, it also defies economic logic. That’s a fact that hasn’t escaped our cousins across the Tasman Sea—the NZDF has announced  that it’s joining the growing number of military forces which are ditching their Steyrs for AR-15 pattern rifles. 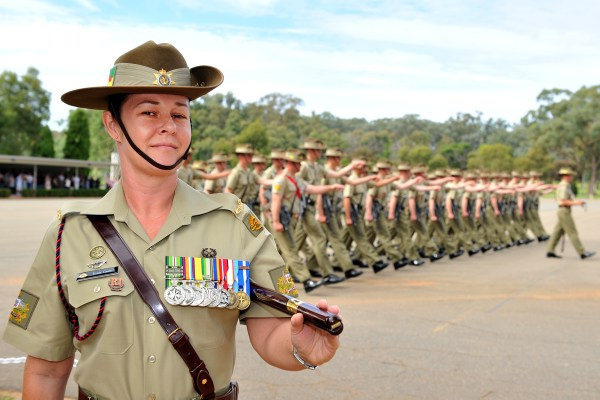 The ADF stands with most militaries in developed countries in its approach to dealing with difference among the men and women who serve in its ranks, but that’s nothing to be proud of. We should be doing better. One might hope that if the moral imperative to rethink this issue isn’t compelling to those who make the decisions, then at least the drive for military effectiveness might be. Deane-Peter Baker is a senior lecturer in the School of Humanities and Social Sciences at the University of New South Wales, Canberra. Image courtesy of Flickr user Australian Department of Defence.